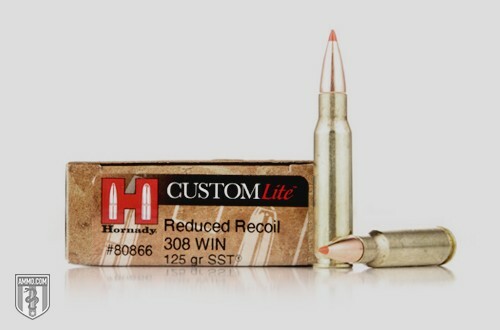 The Super Shock Tip (SST) is a bullet style created by Hornady and is used in a variety of their rifle rounds. All of the most common centerfire calibers, from .243 to .308, are offered with the SST bullet. This particular bullet is quite popular among reloaders because it’s high-quality polymer tipped and has an expanding bullet that is extremely versatile. It can be used for everything – from backyard shooting to varmint control to big-game hunting – and the boat-tail design makes it relatively easy for reloaders to work with. Deer hunters have sizable online communities dedicated to using these bullets and the Hornady lines that incorporate them. This is because they are high velocity, ultra-flat trajectory, rapid expansion bullets that can take down large game like deer, moose and antelope quickly – as long as they are placed properly. Ultra-Flat Trajectory: Due to being very aerodynamic, shots can be grouped at relatively “extreme” long range compared to round nose, hollow point and other “normal” style bullets and the rounds that use them. Boat Tail: A favorite among long-range shooters, the boat-tail design gives less drag as it flies through the air and less “drop” at range. Snipers prefer boat-tailed bullets – and if they are good enough for snipers, boat tails must be better than your average chunk of flying lead. Polymer Tip: The polymer tip style bullet gives you a similar controlled expansion effect as a hollow point, but with the aerodynamic profile of a pointed tip. This doesn’t mean a whole lot at short range, but at extreme distances, the accuracy can really be noticed. The size, shape, depth and polymer hardness also controls expansion – giving it the perfect amount of penetration before the tip breaks up, fragments, or otherwise dissipates. This uniform behavior is great as hunters know exactly what to expect. Interlock Technology: Hornady’s Interlock design basically covers multiple aspects of the bullet design – including a tapered jacket, the tip/expansion properties, lead alloy core and high muzzle velocity. Without a doubt, any ammunition that features the SST from Hornady is a pure, high-quality hunting round. Due to the high velocity and this being rifle ammo, it’s not a good choice for home defense – unless you’re defending an extremely large area. Overall, the Super Shock Tip is a great choice for hunters, and it’s a pretty satisfying backyard shoot. It has that nice blend of penetration versus expansion, combined with an intended long range and high accuracy, making it a better-than-average bullet type.